Tales of good and evil, of heroes defeating villains, are timeless. Thanks to modern technology, entertainment through electronic media is growing at an exponential rate. Yet live entertainment continues to delight audiences. When you can put all of that together, you have something really special. You might even say magical. Harry Potter came to DeVos Performance Hall on Friday, thanks to the Grand Rapids Symphony, the 2001 film, Harry Potter and the Sorcerer’s Stone, and concert sponsor Howard Miller Company. It was an exciting night to remember. So was the next one. 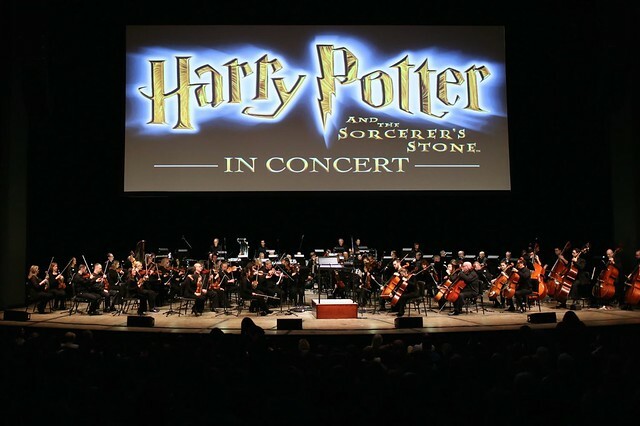 The Harry Potter Film Concert Series debuted in June 2016 in Philadelphia, and the Grand Rapids Symphony became one of the first orchestras in the United States to book the show. It’s since been all over the world. But it’s hard to imagine audiences anywhere could be as excited to relive the tale of the boy who lived as they were this past weekend in DeVos Hall. The Grand Rapids Pops sold out three performances totaling more than 7,000 people. Many came early for free wands at Ollivanders, for free photos of themselves with a Sorting Hat, or to have a butterbeer before the show. The shared experience was enchanting at each show. Odds are everyone who attended has seen the movie before, possibly many times over. Yet the muggle-filled audience laughed heartily at the lighter moments – Harry’s cousin, Dudley, falling into a snake pit at the zoo; Seamus blowing things up; Hagrid’s repeated mantra, “I shouldn’t have said that” – as if they were experiencing it for the first time. In a sense, they were. Everyone was hearing, for the first time, John Williams’ Oscar Award-nominated score played live by the Grand Rapids Symphony. Guest conductor Nicholas Buc, a long and lanky Aussie, commanded the orchestra with broad gestures, sweeping movements, and energy of his own. Buc, who has led performances of Harry Potter and the Sorcerer’s Stone from Paris to Tokyo, played ringmaster, revving up the audience at the start of the show by encouraging them to cheer for their heroes and hiss at the villains as they appeared on screen. At Saturday’s shows, the cheers were especially pronounced at Harry Potter’s first visit to Ollivanders' Wand Shop. Actor John Hurt, who played Ollivander, died Friday at age 77. “We encourage significant displays of house pride,” Buc said at each show. Each audience took him at his word, which contributed immensely to the experience. The Grand Rapids Symphony did the rest. If you’ve never seen a movie with live music, you’re probably wondering what the fuss is all about. Live music generates excitement you can’t otherwise get from just a movie. That’s because part of the show is happening in real time, right before you. It’s fresh, and new, and you know it. Even when you get caught up in the experience of watching a lively game of Quidditch or the deadly drama of a game of Wizard’s Chess, you’re still aware what you’re hearing is coming at you live. The air pulses with new energy, and it crackles with fresh excitement. A simple action, such as Albus Dumbledore, clicking his deluminator to extinguish street lamps, accompanied by a swirl of string instruments, deepened the experience. The musical punctuation that accompanied Harry Potter trying out magic wands rejuvenated the merriment. The tenderness expressed the first time Harry Potter glimpsed his parents in the Mirror of Erised was heart-wrenching on a higher level. Harry Potter’s first glimpse of Diagon Alley, powered by the Grand Rapids Symphony playing the sparkling score, made the wonder of it all even more wondrous. What’s more, the truly surround sound of a 90-piece orchestra in a concert hall reveals aspects of the music not as apparent in the original movie soundtrack. Six French horns, flutists doubling on piccolo and alto flute, four keyboards including celeste, all saw plenty of action. The brass instruments play a lot in the action sequences. Even after more than two hours of playing, the brass were strong to the finish when Harry Potter came face-to-face for the first time with Voldemort. In many respects, the heroes of the night are the woodwinds. The arrival of the first mail by owl at Hogwarts was an ordinary experience in the life of Harry Potter and friends, but it was underscored by an extraordinary performance in the Grand Rapids Symphony’s flute section. In this tale of good and evil, bassoons hardly ever stopped for a breath. Often they were an integral part of the melody. Performing to a 160-minute-long movie is no small feat. Movie scores typically are recorded in several sessions over many days. The tracks are stitched together in a recording studio and later edited into the final cut of the movie. Never is a score played in one setting from start to stop – except in a concert hall before a live audience. It’s rather like running a marathon at a sprinter’s pace. If that doesn’t impress you, consider that the Grand Rapids Symphony ran that marathon, not once, but twice on Saturday and still was going strong at the finish line at nearly 11 p.m. on Saturday. Here’s the final proof that shows such as Harry Potter and the Sorcerer’s Stone are one-of-a-kind. Nearly everyone stayed put for more than five minutes of end credits to listen to the Grand Rapids Symphony play. When was the last time you saw that in a movie theater? Harry Potter is a cultural phenomenon unlike any ever seen before. Seven books have sold more than 400 million copies and counting. Its eight films are the second highest-grossing concert series of all time. J.K. Rowling is the world’s only billionaire author. Ian Fleming wrote more books about his British spy James Bond, and many more movies have been made featuring the exploits of 007. But none of those movies could fill an audience with three and four generations of fans of all ages. If you missed Harry Potter and the Sorcerer’s Stone this past weekend, fear not. The Harry Potter Film Concert Series returns next season with the second and third films, Harry Potter and the Chamber of Secrets on Sept. 29-30 and Harry Potter and the Prisoner of Azkaban Feb. 9-10, 2018. Shows are at 7:30 p.m. Friday and 2 p.m. Saturday for both. Tickets go on sale Mon. Jan. 30. Don’t wait.